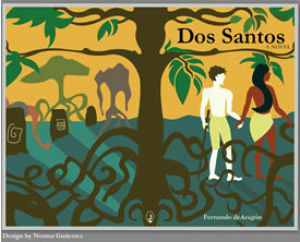 Dos Santos, Fernando de Aragón’s first novel, based on the characters and events leading to the first European settlement of Puerto Rico and the encounter with the local Taíno people, was a finalist and runner-up in the category of Best Historical Fiction of the 15th Annual International Latino Book Awards. The book was first published in November 2011. The cover art and design are the work of Norma Gutierrez. The first-prize winner was Sandra Ramos O’Brian’s The Sandoval Sisters’ Secret of Old Blood. The novel follows the main character, Antonio Dos Santos, who joins Ponce de León and 50 others as they sail to Puerto Rico. There he meets the local Taínos and finds challenges to his long held beliefs and loyalties. The book offers a rare glimpse into the life of the Taíno culture of the period, while retracing a fascinating chapter in the early Spanish conquest of the ‘new world’. The winners of the International Latino Book Awards was announced at a gala event at the Cervantes Institute in New York City on May 30, 2013. The authors’ books will be displayed at BookExpo America taking place that same weekend in New York. Mr. de Aragón is a self-published author who works as director of the Ithaca-Tompkins County Transportation Council in Ithaca, NY, where he lives with his family. Born and raised in Puerto Rico, he’s had a lifelong interest in history, in particular the dynamics of the cultural encounter of Europeans and the Taínos. The author holds undergraduate and master degrees in planning from Rutgers University and a doctorate from the University of Pennsylvania. To learn more about Dos Santos, please visit the author’s website http://www.dossantosnovel.weebly.com . Dos Santos can be found online and locally in Ithaca at Buffalo Streets Books and Diaspora in the Commons. For more information about the International Latino Book Awards, please visit their site http://www.lbff.us. The awards, one of the oldest Latino literary award competitions and by far the largest, honored 148 authors and publishers during the 2012 awards. Presented by Latino Literacy Now, it includes participants from Latino/Latina authors from around the world. Founded in 1997, Latino Literacy Now is a California non-profit organization that promotes literacy and literary excellence in the Latino community. In addition to the International Latino Book Awards, the organization hosts the Latino Books into Movies Awards, the Latino Literacy Now Lifetime Achievement Award for excellence in publishing and, in association with Edward James Olmos, noted actor, director and community activist, the Latino Book & Family Festival series.